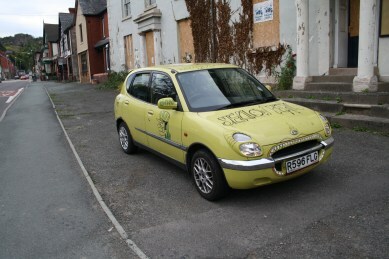 New car – behold the Sirion – HubNut – celebrating the average! Firstly, I apologise for the delay in reporting this latest purchase. I bought the car at 4pm yesterday afternoon and have been having so much fun with it that I haven’t really found time to get a Blog written. That’s very lax of me and I apologise. So, I have bought a Daihatsu Sirion. Not an obvious choice perhaps, but a process of elimination left me desiring something slightly modern (by my standards! ), quirky and small. In a fairly recent Blog, I bemoaned the lack of something small and oriental on the fleet. Lo and behold, I’ve got something! Quite a pretty little thing isn’t it? Daihatsu continued to excel at the small-car game, with the Charade in several generations and the tiny Kei-car Mira. Oddly, Daihatsu also excelled at building 4x4s for farmers in the form of the Fourtrak. Several are still in use locally. Sadly, despite being the first, Daihatsu quit the European market earlier this year (2013). Very sad as it was a company that brought a decent level of quirkiness to anotherwise dull world of moderns. Anyway. I found myself in Chester yesterday faced with this. 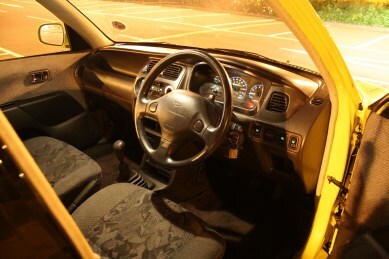 It’s a 1998 Daihatsu Sirion+ 1-litre manual. It has a thrummy three-cylinder engine, a healthy specification (electric windows all-round, PAS, air con), some questionable artwork and a fair dose of rot. Clearly the only sensible thing to do was hand over £370 and drive it almost 100 miles back home. After three-and-a-half hours on the train, a car really was my only option! And, to engage road test mode for a moment, the Daihatsu Sirion really is a joy on the open road. The engine is surprisingly willing for just 50bhp (thank a kerb weight of 740kg for that) and it sounds superb. Despite a potentially frantic 4000rpm at an indicated 80mph (actually fairly close to the legal speed limit I’m sure officer, allowing for speedo inaccuracy, ahem) it is turbine smooth at high speed. In fact, it’s almost as refined as my 188bhp, 3-litre Mercedes was! Astonishing. Well, ok. The ride is a touch bouncy, but then the Japanese have never really managed to tailor suspension to suit British roads. I guess they can’t comprehend driving around on roads that are quite so damaged. The steering is a bit too light, but it’s very direct, so you don’t have to twirl the wheel. It’s very easy to pick your line and the Firestone tyres don’t seem too keen to send me off into the scenery. The gearbox is a delight, with a short action and great feel. Sadly, this highlights that third gear synchromesh is past its best. The clutch is light too, though biting a bit too close to the floor for my liking. The brakes are pretty good, though the pedal goes from dead to responsive in a slightly unpleasant manner. I find it comfortable too. In fact, the cosy interior is a lovely place to sit. Sure, the switchgear is a bit typically-Japanese and not all that well thought out, but switches feel of good quality and everything works. It’s acceleration that provides the biggest giggle though. The engine barks like the half-a-V6 it is, the transmission screams like a muted rally car and it gathers speed surprisingly well. I really am very fond of this car. As you can see from the picture above, I’ve already started to remove the artwork. 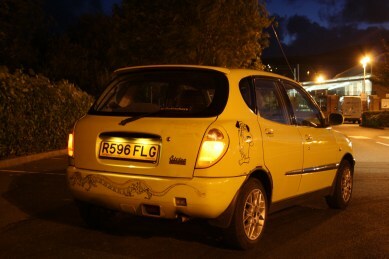 I like funny looking cars as much as the next man, but the Sirion is quirky enough on its own really. It doesn’t need cheap tricks. I also need to tackle the corrosion in the rear wheelarches. It’s already had a load of welding for the MOT (still has 10 months remaining until the next) but the back end has been properly rust-proofed since.